ARAHURA (1983/12735grt/IMO 8201454) undocking from the Babcock Fitzroy drydock in Auckland, New Zealand following routine maintenance. After taking her port and starboard lifeboats aboard she headed south to her home port of Wellington to recommence her daily crossing of the Cook Strait to Picton in the Marlborough Sounds. 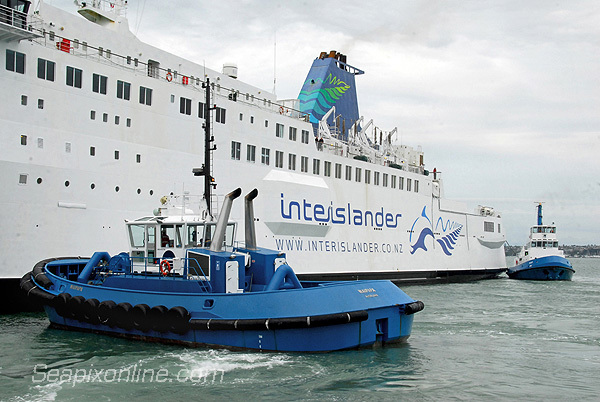 She is assisted here by the tugs WAIPAPA (2000/338grt/IMO 9212072)and DALDY (1977/226grt/IMO 7519127). Scrapped at Alang, Nov 2015.